I went to New York Comic-Con on Friday with my husband and a couple of our friends. It was going to be different from the years past because I was getting more freedom with a mobile scooter. I have severe anxiety that surprisingly doesn't paralyze me, but my heart races as bad as a cartoon whose just fallen in love. You know the one. With their hearts beating hard against their chest like they're trying to escape. Before we even entered I saw Garnet in wedding garb from Steven Universe. She was getting a professional picture taken, but I didn't want to miss my chance getting my picture taken with her. I waited and I got a picture with her. She gave me her card. While I was wandering around I found a familiar booth where a few years ago I bought the first books of First Law of Mad Science and The Creators. One of the creators of the series and I got to talking. He had this anthology called 120 Project. He told me how his wife and him had gone on a road trip and collected stories on their journey. All the proceeds for this book would go to the ACLU. I couldn't help but buy the book and a really cute shirt. I've read the first four very powerful stories. I'm even more glad I bought it now. But the comics and the articles aren't the only thing the couple is working on a documentary film and dance theater work. I told him a little about my work to. I gave him my card with a couple companies I work with on the back. We talked about Writer's Outlet and everything. He seemed genuinely interested in joining. He also gave me his personal card. They would love to get more comics and stories about social justice. If you want to check them out 120 Project. The next booth caught my attention because I accidentally ran over their table cloth. Since I was there one of the writers and I talked about the comic in front of me. Legba's Juke Joint by C.W. Thayer and Ron Milts is a comic that follows a blues musician Reggie DuBots as he travels to the famous crossroads in Mississippi in 1939 to make a deal with the Devil. The book has an accompanying CD of the music of the decade. There's going to be nine books following musicians throughout the decades. This book recently came out, but they have the music planned out through the sixties. As we talked about it I couldn't help but think about my Dad and Jess. I ended up buying the book, and as a part of the deal I got the book autographed, the CD, and decals thrown in for no extra charge. I wanted to see more information about the new Disney show Marvel Rising: Secret Warriors especially after getting a picture with a Spider-Gwen and Squirrel Girl (with Tippy). Unfortunately, I was a day early, but I did get a few free posters and coloring pages. There was an opportunity to win free stuff, but I was unable to even try because I couldn't get close enough or be loud enough. I had twelve picture opportunities. The biggest thing I got was a Soul Eater wall scroll. The ride home was one of the most miserable rides and I felt sick the whole way. As it turns out my husband and our friends have also a great time. Since Comic-Con I've looked through some of the books and magazines I got a bit. I finished a Steven Universe comic already. As I mentioned earlier I started reading In Praise of Difficult Women and 120 Project Anthology. On Sunday Jess and I got to talking about vacations, reading, and writing. 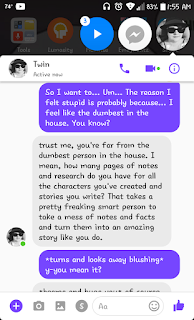 She shared six articles she wrote with me as long as I told her what I thought. It was an amazing day of reading her writing. That night I read an article from the anthology was Arizona: This is Personal with a Stop Sign drawing saying, 'STOP and Talk to Your Family'. I'm going to be very honest, I'm glad my sister and I were able to be more open with each other before I read it. I've gotten closer to my family recently, and this article kind of drove in why we should be more open and honest with each other. While going through everything from Comic-Con I've been getting inspired to write more and finding more important information about my characters. A few days ago, July 3rd, I was reading the latest issue of Reader's Digest. The first article that caught my attention was 'Why I've Decided Not to Write a Memoir'. It was about a woman who being given a very detailed and loving letter from her grandmother about why her grandmother couldn't write a memoir even though she had so many stories collected. This article made me reread the first Treasured Memories I wrote almost a year ago. A lot has changed since that draft for some, and I want to add more people as well. Some bonds have grown stronger, and others have made their mark in my lately. Books named in the memories will be linked in the bottom. I will be using Goodreads links because Goodreads is also important to a few memories. WARNING: THIS WILL BE MY LONGEST BLOG ENTRY. Worked on this through August 6 through September 4. Started this post August 10th. I love writing, and even if I post under a my own name or I post under no name I always put my blood, sweat, and tears into my posts, stories, and more. Earlier this year I found out that I love to guest blog, and I only wrote two posts before the blog was taken down. I went to all my outlets and resources looking for a place to repost my writing. Jared was the first to answer. I informed him I was scared to post under my name. My stuff needed to be shared even if I couldn't be brave enough to share it under my own name. He informed me that I could make a secondary account as long as I had another email. One of the many things I love about the app Jared created is how much he cares so much about the writers, the community, and everything.